LRBR College of Engineering Recruitment 2019 Professor/Assistant Professor/Associate Professor Jobs Notification,Jobs in LRBR College of Engineering Notification 2019 For Professor/Assistant Professor/Associate Professor,Professor/Assistant Professor/Associate Professor Jobs in LRBR College of Engineering. jobs you can apply from 20-03-2019 to 30-03-2019. 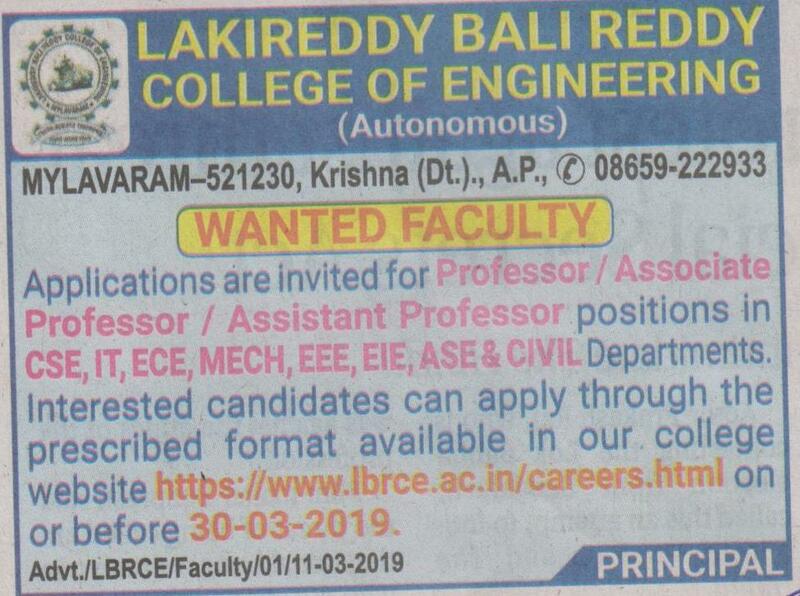 Interested Candidates can download the Application Form www.lbrce.ac.in.for Lakireddy Balireddy College of Engineering Professor/Assistant Professor/Associate Professor Vacancies. Eligible applicants can submit the application form with all required Certificate Copies has to be send the following address of LRBR. Further Details to see the Official website www.lbrce.ac.in. Required Details like Salary, Important dates, Selection Process,Email-id, Postal Address, Qualification are given below. Professor/Assistant Professor/Associate Professor Jobs in LRBR College of Engineering. 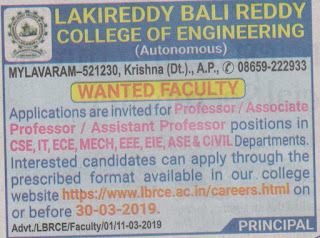 Lakireddy Balireddy College of Engineering (LRBR). Interested and eligible applicants can download the application in our college website and apply through the prescribed format remaining details given Below. Last date to apply is 30-03-2019.